The children learned about the story of the Ascension and the coming of the Holy Spirit at Pentecost. They then retold the story in their books. They described the moment that the Holy Spirit came to the apostles in detail. We then as a class created a word bank of religious vocabulary for our Energy topic and discussed the meanings of the words. Children have been busy writing their own Ancient Greek myth. They wrote the opening, build up and ending over the week. They are now finished and the writing is fantastic! 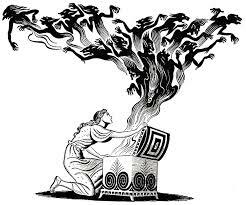 In Reading Comprehension, the children read an Ancient Greek myth called Pandora's Box, which is about a girl who opens a box to surprises. In Guided Reading, the children are reading another myth called Perseus and Medusa, which is about a three headed creature. This week in Geography, the children looked at the country Greece. They worked with a partner and used the internet to research facts about Greece. They found out about the climate, the capital city, population, currency, language, famous buildings and what the flag looks like. They then thought of questions their own questions and researched to find out the answers. We located Greece on a map of Europe. They looked at the seas, mountains, islands and other physical features. We all found out a lot about Greece! The children looked at travel brochures and then designed a poster to persuade people to visit the country. They included all of the facts and information that they have learned this week.